The lesson rapidly returns from any discussion of the Law and legalism to the issue of licentiousness. Consider that out of the 15 verses selected for this lesson, only a portion of this one verse involves anything to do with licentiousness. The conclusion of the verse, "but through love serve one another", is a call to how a Believer should live, not a discussion of licentiousness. The lesson asserts that this verse marks a turning point in the book of Galatians where Paul moves from theological content to practical advice about living. This is an unrealistic characterization. 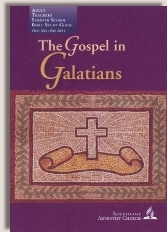 The entire book is centered on theological content. And this theological content is consistently related to how Believers live. There is no reason to separate these two except, perhaps, to encourage people to gloss over the "theology" that might challenge their doctrinal understanding and focus only on the "how we live our daily lives" questions. There is nothing in this lone verse that would pose any challenge to SDA doctrine or practice. As a result, we witness an extremely straight-forward explanation of the entire passage. There is none of the mis-direction or skipping part of the passage that we have seen repeatedly in other sections. This entire lesson is a solid study on the verse in question. The lesson points out the common reaction to Paul's presentation of the Gospel as seen in Romans. When faced with the freedoms of the Gospel, some people concluded that Paul was teaching that doing more evil would bring about even more good (Rom 3:8) and that since we are no longer under the law that we would seek to sin more (Rom 6:1-2; 14-15). As good as this lesson is, there are still a few little slants thrown in to keep the reader focused on the SDA doctrinal view of these issues. For instance, the idea that the presentation of the Gospel was simply Paul's "emphasis on the grace and the freedom". This leaves open the possibility that there was a more complete Gospel from which Paul was only emphasizing one part. Which brings us full circle back to the book of Galatians. The false teachers here were presenting that same idea, that there was more to the Gospel than the grace and freedom that Paul had taught; that once the Believers had joined with Christ now they needed to be placed under the Law. The lesson incorrectly assumes that the only people understanding the Gospel message of grace and freedom to be opening the door to licentiousness were those seeking the opportunity to sin. And certainly our sinful flesh will seek excuses. But the people making these conclusions about the Gospel were not just those looking for excuses to indulge the flesh. The Jewish leaders accused him of teaching people contrary to the Law (Acts 18:12-13) and even many of the believing Jews leveled these accusations against Paul (Acts 21:21). I have personally witnessed a similar reaction from SDAs when it is suggested that the 10 Commandments are the Old Covenant and that New Covenant Believers are no longer bound by the 10 Commandments. A common reaction is found in the statement, "Does that mean that it is OK now to murder and commit adultery?" Both views (the one seeking licentiousness and the one fearing that the Gospel leads to licentiousness) fail to account for the real changes associated with the new birth in the Spirit. The lesson includes a quote from a commentary on Galatians pointing out that our freedom in Christ is really a call to a new type of service. Again, this parallels exactly the message of Romans chapter 6. We have not been set free to serve the flesh, or ourselves. We have been set free to serve Christ and, through that service to Christ, each other. I particularly applaud the clear fashion in which the final paragraph brings out the fuller meaning of the passage by looking more closely at the Greek. Recognizing that the love discussed here doesn't come from us, but only from an outside source is central to understanding the relationship of grace and "works" in the New Covenant. The motivation and the work come entirely from the Holy Spirit dwelling in us. Additional commands or instructions about what we "should" be doing don't bring about real fruit. We may try harder and accomplish slightly better results for a time period based on knowing what we should do. But lasting results are only produced directly by God. The concern with this lesson is not the content, it is a solid lesson, but with the overall emphasis taken within this week. The topic of licentiousness is a very minor aspect of the 15 verses being studies, less than one complete verse out of the 15. Yet 2 of the 7 days (Sabbath afternoon and today's lesson) focus on this subject. Why do SDAs have such a great concern about this subject? The final discussion questions continue down this path. The verse studied certainly left open the option to discuss how we serve one another in love. But the author's chose to re-visit, and thereby reinforce, the subject of licentious living. The really interesting element would be the response to the second question "What's so bad about that kind of thinking?" Do the responses to this question include concerns that we put our salvation at risk?